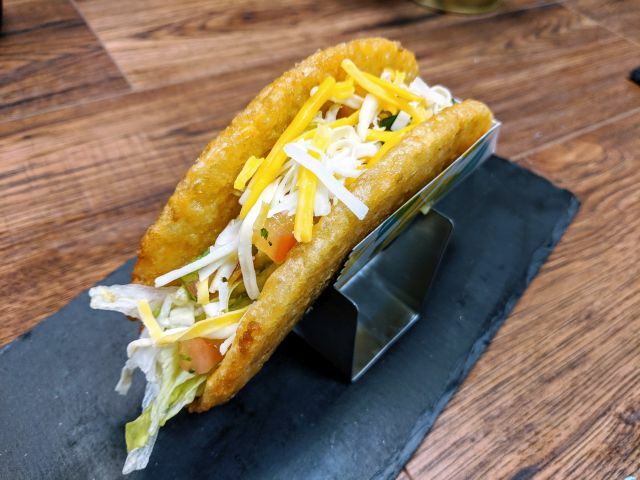 Taco Bell's Quesalupa features a crispy, flaky Chalupa-like shell but with a melted pepper jack cheese core. It comes filled like your standard Chalupa Supreme with seasoned beef, reduced fat sour cream, shredded lettuce, diced tomatoes, and shredded 3-cheese blend. These aren't out until tomorrow but I picked up a couple at $2.99 a piece (compared to $2.49 for a regular Chalupa) under an early pre-order offer. Like a Chalupa, the Quesalupa has a decent heft to it. The fillings are your Taco Bell standard for their tacos, Gorditas, and Chalupas so I'm going to focus on the shell. Compared to the Chalupa shell, the Quesalupa shell is thinner and less bread-y. With its fried, just slightly crisp quality, it reminds me more than a little of a chimichanga. I love chimichangas so that's a good thing. Rather than lining the entirety of the shell, the pepper jack is mostly found in the a line down the middle of the shell where it's folded and kept warm and melted by the seasoned beef. The cheese offered a mellow creaminess with just the occasional whisper of heat. When I bit into the cheese-filled areas, it was like a fried quesadilla. I would not mind it at all if they made a Quesarito with one of these completely filled with cheese. It would probably cost about $1 or $2 more, but it's worth it. Overall, Taco Bell's Quesalupa was really enjoyable. The combination of fried bread, oozing cheese, and classic Taco Bell fillings works really well. I'd be willing to pay more money for more pepper jack though.